Today’s scientists are only now beginning to recognize what the ancient mystics and wise men have told us for thousands of years; that everything, including you, is in a perpetual state of vibration. The most elemental state of vibration is that of sound. All things have an optimum rate of vibration, and that rate is called resonance. When we are in resonance, we are in balance. One way to use sound in healing the body is to recognize that every cell, and every organ, absorbs and emits sound, and has a specific optimum resonate sound frequency. 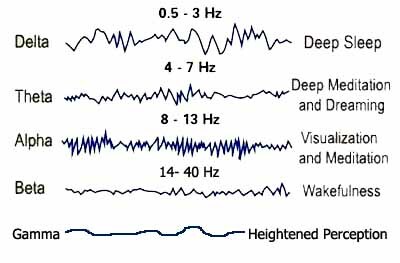 By exposing the body and brain to certain sound healing frequencies, and brain wave frequency music, they will begin to “resonate” with those sound frequencies, much like a drum that begins to vibrate with the rythms around it. If you play two different sound frequencies into each ear, the brain will attempt to find a balance. For example, if the sound frequency in your left ear is 380 Hz, and the sound frequency in your right ear is 390 Hz, your brain will create a binaural beat of 10Hz. These binaural beats are not actually heard in the usual sense, since they are well below the natural range of human hearing, but you can often “hear” the binaural beat as a sort of “hum” inside your head. It has been discovered, binaural beats can be successfully used to elicit responses within the brain. The brain becomes “entrained”, which means it will start to resonate at the same sound frequency as the binaural beat. This can change the brain wave patterns in your brain temporarily, and has been shown to have a huge effect; binaural beats are extremely effective at inducing hypnotic and meditative states. This is a great breakthrough for anyone who has wanted to learn to meditate, but did not have the time or the teacher for formal training. Binaual beat brain frequency meditation can also be more effective than traditional meditation, because of the binaural beats. Binaural beats can reduce stress, calm your thoughts, reduce the amount of sleep you need, and can increase intuition, intelligence and creativity. Scientists have learned our brains operate at five levels of frequency; gamma, beta, alpha, theta and delta. Each level of frequency is measured in cycles per second, or hertz. Isochronic tones are single tones of regular beats, used for brainwave entrainment. Isochronic tones work by pulsing sound at regular intervals, exciting the thalamus, causing the brain to resonate with the frequency of the isochronic tone, changing brainwave patterns. Not all sound healing programs offered on this website are Binaural; some are Isochronic, which means they do not require headphones. There is a an obvious advantage to that, and some of the programs are suitable for use as an “Ambient” background, to help reduce stress, increase energy and more. The Isochronic sleep programs have an obvious advantage; you can play them on your stereo or boombox, without the inconvenience or discomfort of headphones, and drift off into a comfortable sleep. Many of these brain frequency meditations require you to lay down, close your eyes, and relax into the sound. If you have trouble letting go and relaxing, or have a lot of distractions in your environment, then a binaural beat program requiring headphones might do the trick… it formalizes or ritualizes the process, physically cutting off the outside world, and creating more of an inner environment. It’s up to you, try both! Our sound healing, subliminal and self hypnosis audios and videos utilize the life altering power of isochronic tones and binaural beats, sound healing frequencies and the sound vibrations of the Chakras and healing Solfeggio frequencies. b\Brain wave frequency music, mixed with powerful self hypnosis and subliminal scripts. Safely and easily take you to a state of deep meditation. Stimulate the creation of new neural pathways between the right and left hemispheres of your brain, leading you to a high performance state called whole brain functioning. Dramatically improves your learning ability, memory, intuition, creativity, your ability to focus, concentrate and think more clearly. Create quantum leaps in your personal self awareness. Significantly lower your stress levels and calm your thoughts. Create improvements in your mental and emotional health, even areas that have stubbornly resisted change with other approaches. Dramatically increase your production of vital brain chemicals related to your longevity, well-being, and quality of life. Modern science is only now beginning to recognizing what the ancient mystics and wise men have told us for centuries; that everything (including you) is in a constant state of vibration. The most elemental state of vibration is that of sound. Everything has an optimum range of vibration, and that rate is called resonance. When we are in resonance, we are in balance. One way to use sound to heal the body is to recognize that every organ, and every cell, absorbs and emits sound, and has a particular optimum resonant frequency. Emotions and mental states also have certain resonant frequencies; this is the secret behind the transformative power of spiritul music and song, spoken prayers and mantras. When exposed to a resonant frequency long enough, the body (and mind) will fall into sync; if you have ever been to a large rock concert or a rave, you will understand this. If you sing in a choir, or regularly meditate with mantras, you will intuitively understand this too, because you have experienced it. Therapeutic sound and sound therapy techniques are used to realign the “out of sync frequencies” you may be experiencing within you mind or body, by exposing you to the optimum sound frequencies for the changes you wish to make within yourself. Through a combination of alpha and theta brain waves states, deep relaxation, and “suggestibility”, mixed with brain wave frequency music, the subliminal and self hypnosis programs can help you to easily access your subconscious mind, and change the “inner scripts” that dictate you behavior. If you are NOT achieving the level of health, success and happiness you deserve, these sound healing, subliminal and self hypnosis programs can help to change it, much more easily than you “think”! There is a CAUTION…. if you suffer from a seizure disorder, or a serious mental illness such as pschizophenia or a psychotic disorder, we advise you to NOT use binaural beat programs. But for the vast majority of people, these programs are very safe. Always use common sense; don’t drive, use heavy machinery, cook, or do anything potentially dangerous and requiring your full attention while using ANY self hypnosis, subliminal, binaural beat or sound healing program.